For instance, the idea for my book A FINE MADNESS originally came from another book called Class, by Jilly Cooper about the British class system. Jilly has a real eye for humor, so her reflections set me to thinking that I might like to do a bit of a send-up. Then about a month later, my husband and I were visiting a dear friend in Yorkshire, when we drove through a town called Giggleswick, which tickled my funny bone. I just couldn’t pass it up. I had to call an aristocrat Lord Giggleswick so my American heroine could make fun of him. So I had a yen to write about the British class system, and a town called Giggleswick. I was still in England when I was introduced to the unique brand of English eccentric. We passed over bypasses created to let groundhogs and hedgehogs to get across highways, forced on the government by animal rights activists. Add to that the fact that I’ve also long been fascinated by historic homes. When I travel to Europe, when I can I stay in old houses(I’m not the kind of person who can afford those stately mansions). A perfect place for a confrontation between an English aristocrat, an American woman who is restoring a stately home, especially if the Englishman is assessing possible threats to a secret high level meeting scheduled for the reopened house. And what do you have in historic homes? Ghosts. So I had to include a very noisy, very active ghost into the mix. Believe it or not, almost every book is a variation of that. A bunch of ideas gathered everywhere and mixed together like bread dough. There are a lot of ideas I wish I’d thought of. The one that sticks in my mind, though, is Dexter(remember, I also write suspense). A serial killer only killing bad guys? Oh, yeah. I would have loved to have played with that. First I reread the work from the beginning. Then, if something doesn’t show itself, I walk away and do something else. I go walking(I get great ideas when walking., which shouldn’t surprise me. I’m an old ER nurse. I think on my feet). In summer I work in my garden. And lately I’ve been doing mandala coloring books. They’re very Zen. Again, what doesn’t? I was finally diagnosed with ADD when I was 53, which means that the motto on my family crest should be “Squirrel!” When I’m on deadline, my husband has long since kicked me out of the house with my computer, music and the phone number of the local Chinese restaurant, and I spend 3-4 days at a local motel away from TVs, phones, house distractions. It’s amazing how much you can get done when the only thing to look at is a bad picture of the Grand Canyon. Do you write by the seat of your pants (pantser!) or do you carefully plot your stories (plotter!)? Has that changed at any point in your career or maybe it changes depending on the book? I am by instinct a pantser. I put together my characters, their conflict and a few scenes, and then take off. It’s funny. I can see the whole book in my head like a jigsaw puzzle, but until I tell the story I can’t tell it to you in linear fashion. I do need to plot more when I’m doing suspense, because they’re much more plot-heavy, and I usually have several subplots. I hate it. Thanks so much for inviting me to play. 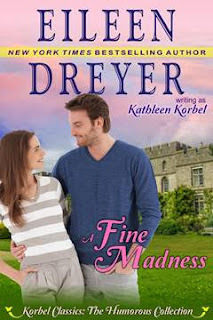 If you want to know more about my books, stop by any time at www.eileendreyer.com or www.facebook.com/eileendreyer/ I’d love to visit. New York Times bestselling, RWA Hall of Fame author Eileen Dreyer has published 31 romance novels in most genres, 8 medical­ forensic suspenses, and 10 short stories.